Alila Jakarta has achieved the prestigious Gold Certification from Earth Check, widely regarded as the world’s most scientifically rigorous environmental management program designed specifically for the travel and tourism industry. 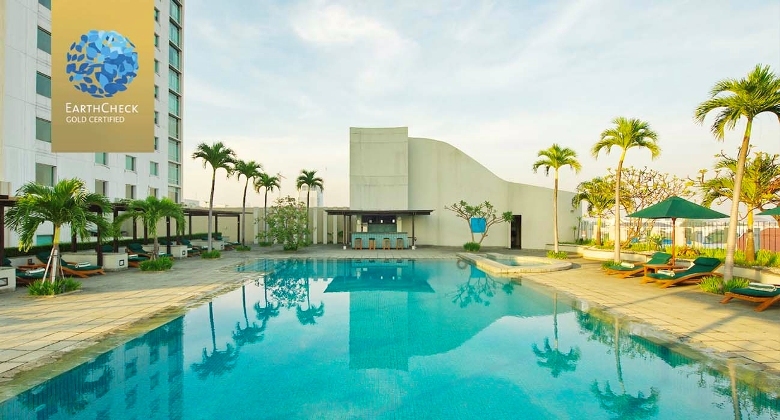 Alila Jakarta is the first built property in Alila Hotel and Resorts’ portfolio. And this is the first time for Alila Jakarta to receive the Gold recognition, a scientifically rigorous and transparent benchmarking program, which quantifies its commitment to reversing environmental damage and building better local communities. Sustainability initiatives at Alila Jakarta are managing waste generated within its own operations, Alila Jakarta’s PIONEER team is also looking at initiatives that encourage greater awareness and better waste management among local communities, such as incentivizing waste collection at the local school, includes a plantation project with a local school surrounding the hotel area, involved yearly program ‘clean-up’ together with Jakarta Clean Up Day’s by staff, guests and local communities, and support of Children education program with Ant Charity Foundation. The Gold level of certification is reserved for organizations that have consistently demonstrated over a period of five years or more their commitment to their host communities and high standards of environmental management. To gain Gold Certification, the hotel was required to submit a year’s worth of operational data to Earth Check for benchmarking against internationally recognized standards of best practice. “This is the first time the hotel has achieved Gold Certification by EarthCheck. Previously, Alila Jakarta achieved Silver Certification for five consecutive years since 2013. This provides our guests, stakeholders and business partners with certainty that our commitment to reducing energy and water consumption is actually taking place and making a positive difference”, said Sebastien Menesguen General Manager of Alila Jakarta. From the outset, Alila Jakarta has put sustainability at the forefront, obtaining the highest level of accreditation from EarthCheck for its Building Planning and Design Standard. Sensitive site planning, use of local building materials, and the incorporation of environmental, energy and resource-efficient systems are integral to its design. With this latest achievement, Alila Jakarta reaffirms its commitment to sustainable tourism practices that aim to restore and conserve the surrounding environment, care for local communities and drive economic health through intellectual eco-tourism. Next articleAlila Seminyak, Bali- INTRODUCING VW KOMBI CARAOKE!